you would sort of wonder whether it's a great idea to ask a confirmed colnago owner/aficionado to review a bike not made by ernesto, because there's a danger that all i'm going to do is compare one with the other. well, i wished not to fulfil this stereotype during my three day ride to paris on an eddy merckx chm full carbon frame, and i hope i have managed to achieve this. and just to whet the appetite for the bit where i tell you what it was like to ride, i'm going to be thoroughly tedious and methodically go through all the bits that constituted the bike. firstly, i think it's worth bearing in mind, when we come to the riding bit, that this machine was sight unseen before the first stage of 150km from london to portsmouth. the bike setup was very tidily taken care of by graeme freestone king who, aside from being the merckx uk importer, is a mechanic of formidable ability. i had e-mailed all the necessary measurements relating to fit taken from the c40 sitting in thewashingmachinepost bike shed, and so accurate was the reproduction, that i didn't even need to adjust the saddle height throughout the entire three day trip. i have never managed that on any of the bikes previously reviewed on the post, and i always thought i was rather good at this stuff. the chm carbon frame is manufactured in italy in a carbon manufacturing facility set up by merckx (this is no third party build), and is of the compact variety. i'm not much of a fan of compacts - entirely for aesthetic reasons - and this was compounded by the seatstays (after they've headed south from the wishbone) curving in a concave, rather than convex manner. but again, this is entirely on the basis of looks and certainly not because of any inside knowledge regarding carbon frame construction. and when you're on the bike, you can't actually see any of this anyway. as seems to be the fashion with every frame made from carbon these days, the bottom bracket seems enormous, especially on such an apparently diminutive frame, and now that the big two have gone for external bearings and oversized bb axles (in this case, a campag centaur ultra torq) it seems that everyone is worried that chris hoy might have a shot of their bikes. for someone who is spindly of stature, this seems like fashion overkill, but hey ho. the top tube did exactly the same as the down tube - moved from a vertically oval shape to a horizontally oval tube, which looked tremendously cool on the top tube because it was almost flat by the time it joined the seat tube. the down tube would have given a cannondale a good run for its money in terms of size, but the frameset looked perfectly balanced overall, even if it initailly looked way too small for me to pedal. the fork was sort of midway between curved and straight, smoothly blending into the head tube by the iplementation of an fsa integrated headset. i must say that i am not in favour of integrated headset (neither is chris king) - not because they don't work: they do, and very well, but it concerns me what happens several years down the line. and if we're to believe the manufacturer spin on bottom brackets, ie moving the bearings outboard increases the torsional rigidity, then how is moving them inboard on the headset a logical move? anyhoo, the back end eschews the smooth roundness of the main part of the frame and becomes angular along the length of the stays (really awkward to fit a transponder, if truth be known) though i did like the way the chainstays curved outwards towards the dropouts. the seatpost was also carbon, and bearing my fizik pave saddle (might as well bring my own comfort with me) and let me lean forward onto a chunky modolo 130mm carbon/alloys stem holding onto a pair of modolo kali bars with those nice flat hand holds on the top. the bars sported a real curve, instead of those anatomic things that i really don't like very much. if there was one criticism of the bars, it was the fact that they started the rearward curve a bit too soon which tended to increase the finger distance to the brake levers. i have quite long fingers, but those with stubbier digits might have a bit of a stretch. try them first. the groupset was the current centaur offering from campagnolo, which meant carbon levers (which don't feel cold in the morning), skeleton brakes, an alloy ultra torq chainset which uses the hidden fifth bolt, rear mech with carbon parallelogram and a clip on front mech. the normal build kit for this machine has scirocco wheels as standard, but since graeme is also the importer for wheelsbike italian wheels, my review model sported a very fetching pair of wheelsbike 2000s (london-paris service wheels were the cheaper wheelsbike 1000s which have a more standard rim profile). these had a slightly deeper rim with regular spokes built radial (18) up front, and 21 at the rear: drive side three cross, non-drive one cross, in the 2 to 1 ratio favoured by fulcrum. 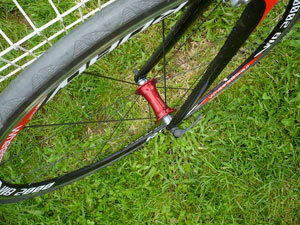 the red anodised hubs were fitted with very smooth cartridge bearings and their own q/r skewers. to finish things off, i fitted the vista pedals previously reviewed in these very pixels which have turned out to be quite a revelation, so much so that i have retained their services for my own bike. 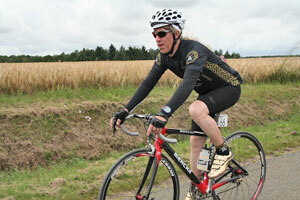 (and comfortably wearing a pair of gold lamŽ vittoria shoes which garnered as much interest as the bike). i had hoped to run the fibre-lyte carbon chainrings, but time and opportunity mitigated against their being fitted, so they unfortunately remained in their flight case (yellow carrier bag) all the way to versailles. 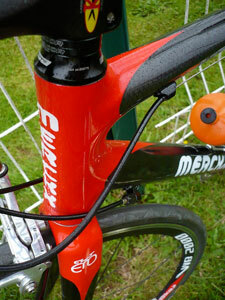 despite my misgivings about a compact frame, when riding, there was almost no difference between the merckx and a more standard frame, other than the top tube being a tad further away from the saddle. and the only difficulty i experienced when cycling was trying to pull the 750ml bottle out the cage without ramming the top closed on the underside of the top tube. how you would ever release one from the seat tube cage is beyond me. partly due to the curvilinear seatstays, and partly to the wheels (regular spokes have a bend in them for good reason, you know), the bike was fabulously comfortable and very 'tight': it manoeuvred incredibly well, which is a major boon when cycling very close to lots of other cyclists that you don't know - often at speed. i've always figured that my only notable ability on a bike is in a vertical direction, and the ride to paris bore this out, though i'm inclined to figure that the bike had a great deal to do with it, along with the vista pedals which, almost without doubt, give more leverage when and where needed. the somewhat oversized bottom bracket junction obviously works, because any stamping on pedals made the bike shift forward or upward (or both) with no fuss. i like to know if a bike climbs well, and the chm did. i'm not too keen on the continental gp4000 tyres, but i'm not entirely sure why. they didn't give me a lot of confidence cornering on a downhill - they felt a bit too rigid, but this may have been due to pilot terror rather than any failing on continental's part. however, if the bike were mine, that would be the first thing changed. despite minor issues with the curve on the modolo bars, the flat top section was great on some of the longer climbs, and i can't say i noticed any degradation in rideability by not having carbon under my hands (though alloy is a bit cooler). i think the best compliment i can pay the stem is that i hardly noticed it, which is really what you want of a stem. it looked a bit too much like a chunky kitkat for my taste, but its replacement for 2007/08 is a much more svelte affair of which i heartily approve. 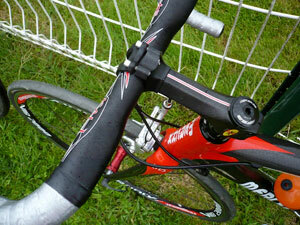 the centaur groupset seemed to behave far better than most of the other groupsets in my london-paris group of riders. while all around was crashing of sprockets, chains and chainrings, the centaur clicked up and down front and rear gears with no fuss and precious little noise. there was nary a missed shift on front or rear - considering the haste with which some of these were made, this is compliment indeed. 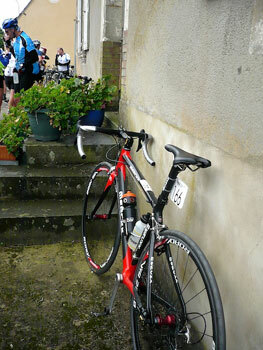 despite several lengthy hills, all was managed with a standard 53/39 at the front and 12/25 at the back. it was pointed out to me that i had been brave to cycle several hundred kilometres on a bike that was sight unseen until about an hour before setting off, and in retrospect, this may well have been true. but the chm performed admirably throughout and i really enjoyed its services. the full carbon eddy merckx chm frame can be yours for a very reasonable £775 including carbon forks and seatpin; the wheelsbike 2000s arrive at around £499;(you can get a pair for yourself from cyclecare, sidcup cycles, longstaffs and pennine cycles). the modolo kali bars cost £41 and the new stem is £54.95. unfortunately, the chm didn't make it to paris unscathed. during a 'stopping very quickly' moment, someone behind me didn't, resulting in a soft fall which tore the down tube bottle cage and alloy inserts clean out the frame. this left two holes and some slightly splintered carbon. 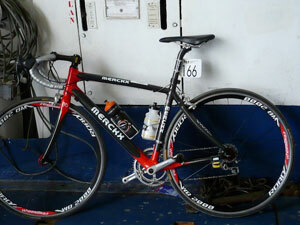 i fervently hope that repairs can be effected because it was much too nice a bike to end its career so soon.